Jesus Christ lizard, that's a weird name for an animal! Or not? Actually, there is a good reason why B. basiliscus is named this way. It can walk, or better, run on the surface of water! This crazy evolutionary trait allows individuals to easily escape terrestrial predators. How this running-on-water thing is achieved is covered later in the article. The species is also widely known as the common basilisk. As a sidenote, it should be mentioned that the Jesus Christ nickname is routinely used for other species of the same genus that also have the ability to run on water. The lizard in the picture above isn't actually a Basiliscus basiliscus but most probably a Green Basilisk (Basiliscus plumifrons). 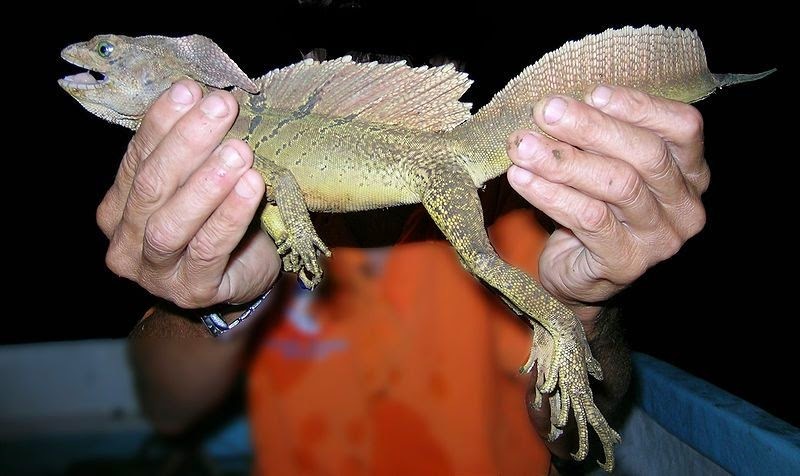 The Jesus Christ lizard occurs in Central and South American rainforests, near rivers and streams. It is usually found in low elevations, from sea level to 600 m. In Costa Rica, it can be found in altitudes as high as 1,200 m (3.940 ft). The species ranges from southwestern Nicaragua to northwestern Colombia on the Pacific side, and from central Panama to northwestern Venezuela on the Atlantic side. In Costa Rica, it is typically found on the Pacific side of the country. 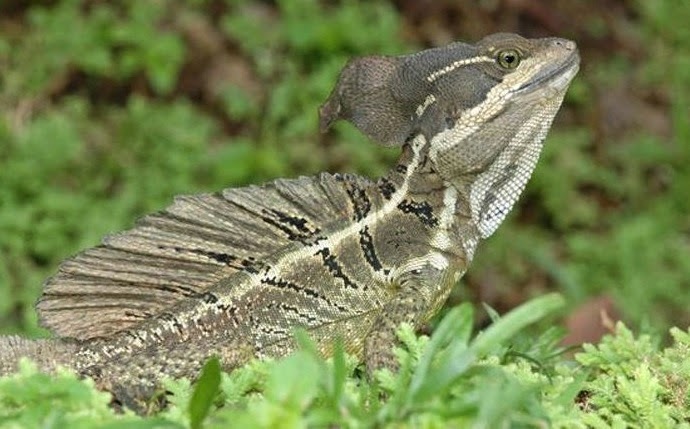 The common basilisk has also been introduced to Florida as a feral species. Adults reach a maximum length of 80 cm (31.5 inches), with the tail comprising 70 to 75 % of the total length. Weight ranges from 200 to 500 g. Both sexes have a brown to olive color, with a white, cream or yellow stripe on their upper lip and a second stripe along either side of their body. These stripes have higher contrast in juveniles and fade as they grow older. The belly is usually yellow. The species exhibits sexual dimorphism. Males are easily distinguished by the head, which is adorned with a crest and a colored dewlap. The crest is supported by elongations of the neural spines. Males can also be distinguished by their tail which has sail-like crests. Finally, females are smaller in size, with their average weight ranging from 135 to 194 g.
These lizards have long limbs, with big toes and sharp claws. Their mouth is relative big and features many saw-like teeth, placed on the inner sides of the jaw. On ground, the species is capable of speeds of up to 11 km/h (~7 mph). Although these strange animals are best known for their ability to run on water, they are also excellent climbers, swimmers and even divers! Adults can stay under water for up to half an hour. In captivity, individuals commonly reach the age of 7 years old. However, their average lifespan in the wild is assumed to be way smaller, due to predation. 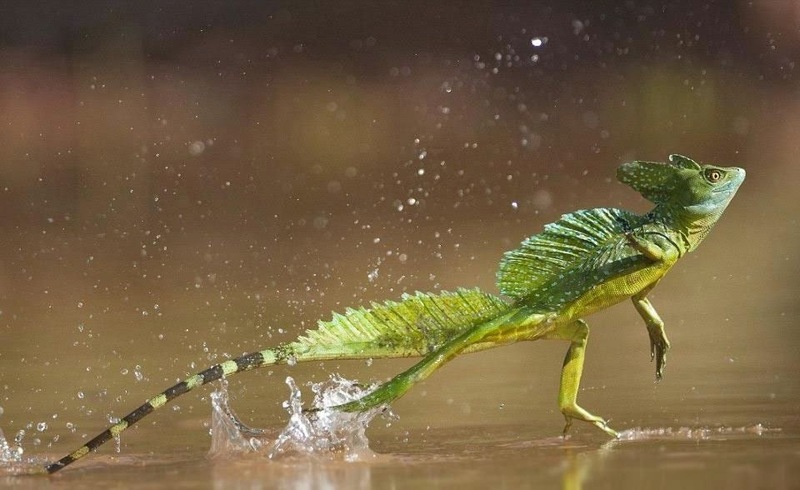 The species -- along with other members of the same genus -- has earned the nickname "Jesus Christ lizard", thanks to its extraordinary ability to run on water. This feat is accomplished with the help of their long toes on the rear feet with fringes of skin that unfurl in the water, increasing the surface area. The mechanics of this ability can be summarized in three steps. First we have the slap, a downward movement of the foot that pushes water out and away from the leg, creating pockets of air around it. Next comes the stroke, which is the backwards movement of the foot that propels the lizard forward. Finally, we have the recovery, which is when the foot comes up and out of the water, preparing to do the slap again and continue the cycle. The maximum distance covered depends on the lizard’s overall size and weight, with juveniles usually running larger distances than older individuals. Juveniles can run 10 to 20 m (32-64 ft) whereas adults up to 4.5 m.
They are diurnal animals, meaning that they are most active during the day. They spend most of the day near water, foraging and basking by the banks or on overhanging branches. During the night, they sleep on branches. . Males are very territorial and commonly bob their heads as a threat or as a courtship gesture. Camouflaging and concealing under forest leaves is their main line of defense. When discovered, it will flee by running on water! Females reach sexual maturity at the age of about 20 months old, whereas males reach sexual maturity after about 16 months. However, males may not actually mate until they are three or four years old, after having achieved sufficient status in the dominance hierarchy. Depending on the area, the breeding season may be up to ten months long. Little reproduction occurs during January and February. After mating, females lay 5 to 8 clutches of eggs, each containing 2-18 eggs. Mothers lay their eggs in a nest cavity which is then covered back over with soil. The eggs are roughly 2.4 cm by 1.3 cm and incubate by themselves. On average, eggs hatch after about 88 days. However, it may take as long as 143 days and as short as 55-60 days, depending on the climate. Hatchlings have a snout-vent length of 3.7 to 4.3 cm. (~1.4 to 1.7 in) and weigh about 2 g.
The species conservation status is not officially assessed. However, this weird animal doesn't appear to be threatened, thanks to its wide distribution and its seemingly abundant numbers. - The common basilisk is named after the "Basilisk" creature of Greek mythology, made up of parts of a rooster, snake, and lion which could turn a man to stone by its gaze. In European bestiaries and legends, a basilisk is a legendary reptile reputed to be king of serpents and said to have the power to cause death with a single glance. Basilisk is a greek derived word, from the word basilískos (βασιλίσκος), meaning "little king". 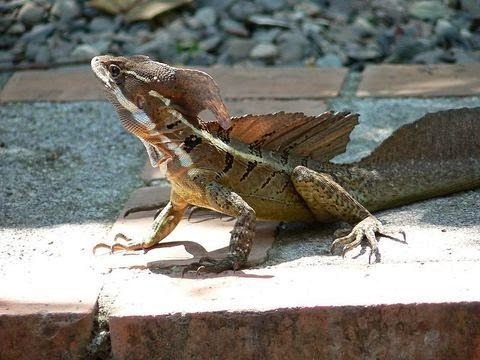 - The Jesus Christ lizard is many times confused with the Green Basilisk (Basiliscus plumifrons), a closely related and similarly looking species, ranging from eastern Honduras, through Nicaragua and Costa Rica, to western Panama. - Robert George Sprackland (1992). Giant lizards. Neptune, NJ: T.F.H. Publications. ISBN 0-86622-634-6. Those animals are so lucke i want to run and walk on water so badly!!!!!!!!!!!!!!!!!!!!!! !